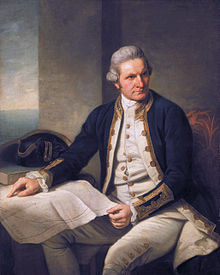 In 1778, British Captain James Cook discovered Hawaii, which he named "The Sandwich Islands" in honor of John Montagu, the 4th Earl of Sandwich -- the acting First Lord of the Admiralty. 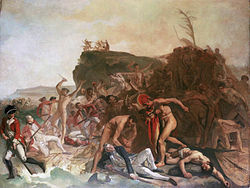 Captain Cook was killed on his third visit to Hawaii in 1779. 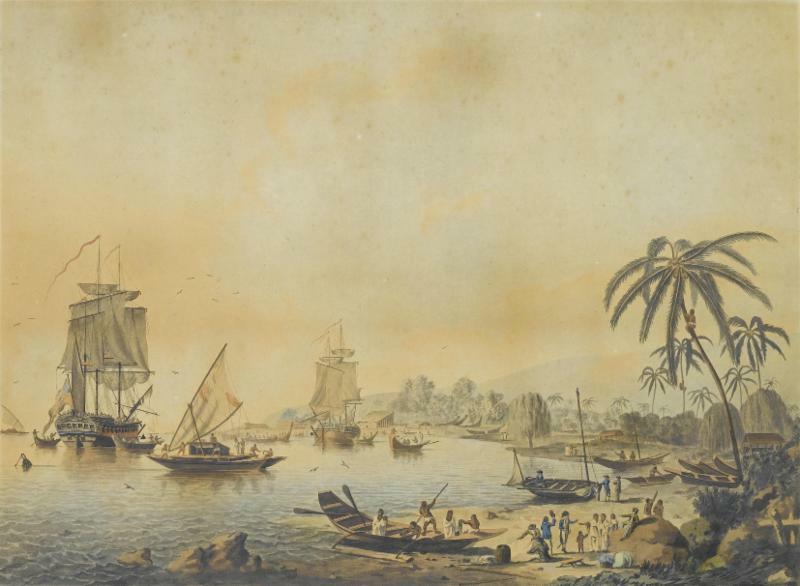 When Captain Cook's voyages were read in England they raised awareness of new lands and inspired a missionary movement, led by William Carey, who took the Gospel to India in 1793. 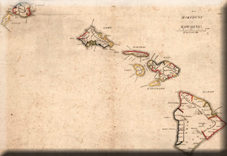 The Hawaiian Islands were united by King Kamehameha I in 1810. 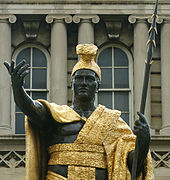 In 1819, King Kamehameha I died. 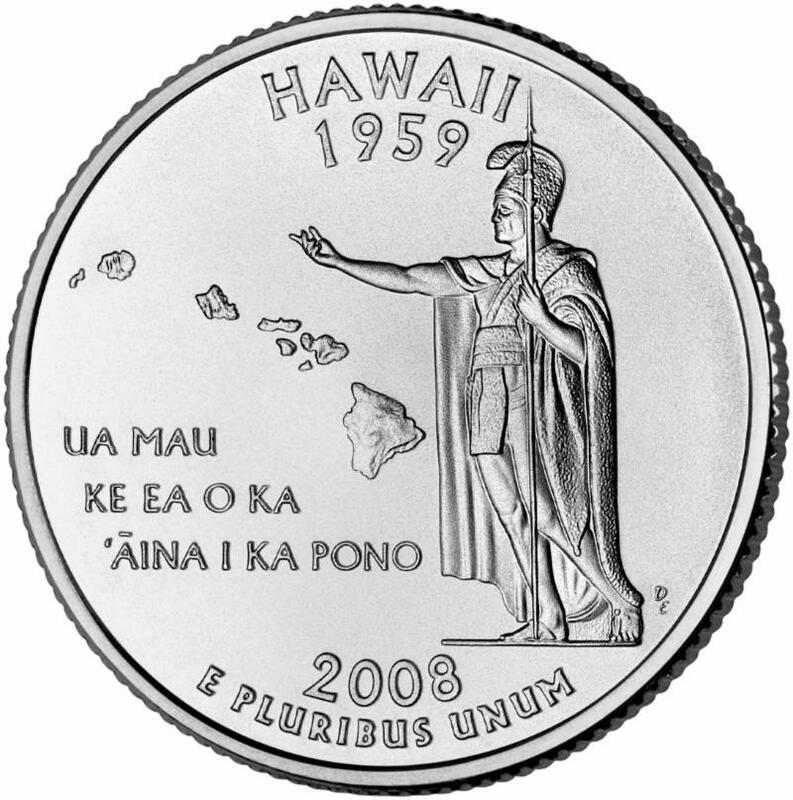 His wife, Kaʻahumanu, and his son, Liholiho (King Kamehameha II), abolished the pagan religion with its kapu rules and human sacrifice. 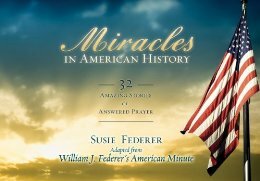 The Second Great Awakening in America sparked a global missionary movement. 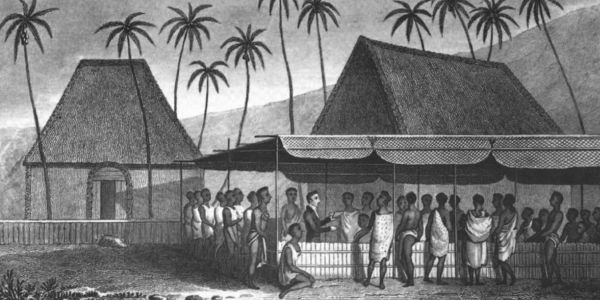 ﻿In 1820, the first missionaries arrived in Hawaii from New England on the brig Thaddeus. 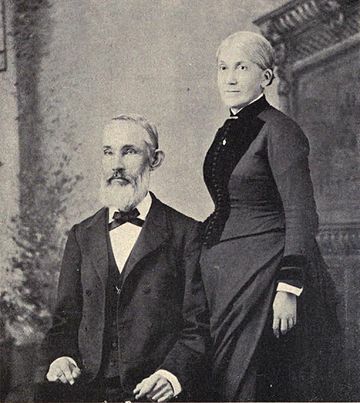 They were led by Hiram Bingham, and Yale graduate Asa Thurston , and his wife, Lucy. Hiram Bingham's son, of the same name, attended Yale, then returned to spread Christianity in the Pacific. 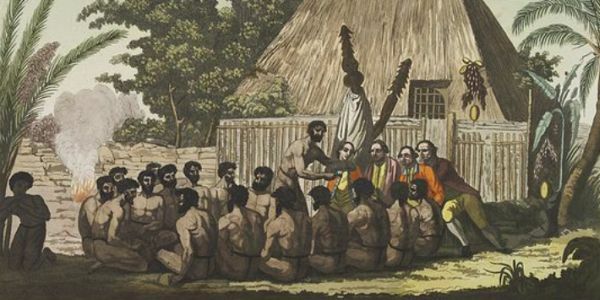 He was the first to translate the Bible into the language of the people of the Gilbert Islands. 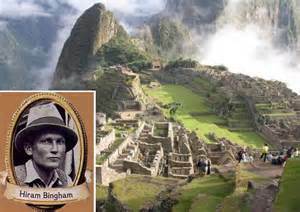 Hiram Bingham's grandson, of the same name, discovered the Inca city of Machu Pichu in 1908, then became Governor of Connecticut and a U.S. Senator. Hiram Bingham IV was an American diplomat who helped Jews flee Nazi forces during World War II. In 1822, Missionaries Hiram Bingham, Asa Thurston , and Elisha Loomis created Hawaii's 12-letter alphabet, then translated the Bible into the Hawaiian Language. 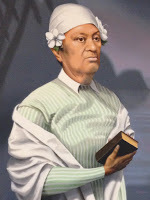 On November 22, 1822, Betsey Stockton, a young African American woman from New Haven, Connecticut, set sail with the second group of missionaries for the for a five-month voyage to Hawaii. 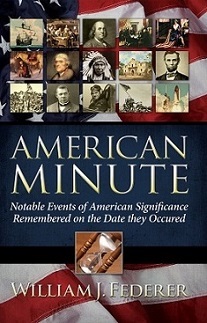 Commissioned by the American Board of Commissioners for Foreign Missions, Betsey Stockton was the first single American woman sent overseas as a missionary. 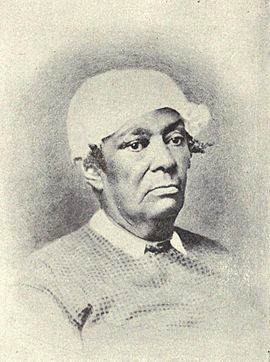 An edition of Betsey Stockton's Hawaiian diary was published in the Christian Advocate, 1824 and 1825, by Dr. Reverend Dr. Ashbel Green, President of Princeton University. "The 29th was the Sabbath. I went in the morning with the family to worship: the scene that presented itself was one that would have done an American’s heart good to have witnessed. Our place of worship was nothing but an open place on the beach, with a large tree to shelter us: on the ground a large mat was laid, on which the chief persons sat. 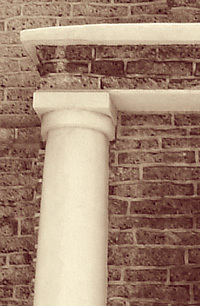 To the right there was a sofa, and a number of chairs; on these the missionaries, the king, and principal persons sat. The kanakas, or lower class of people, sat on the ground in rows; leaving a passage open to the sea, from which the breeze was blowing ..."
Honoru acted as interpreter: the audience all appeared very solemn. After service the favorite queen called me, and requested that I should take a seat with her on the sofa, which I did, although I could say but few words which she could understand. 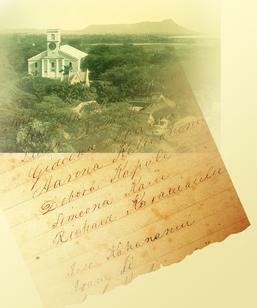 Soon after, bidding them aroha , I returned with the family ..."
"In the afternoon we had an English sermon at our house: about fifty were present, and behaved well. In the morning one of the king’s boys came to the house, desiring to be instructed in English. Mr. S. thought it would be well for me to engage in the work at once. Accordingly I collected a proper number and commenced. 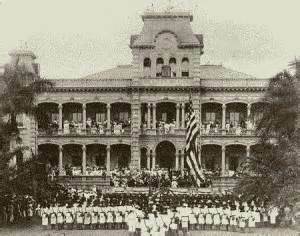 I had four English, and six Hawaiian scholars." 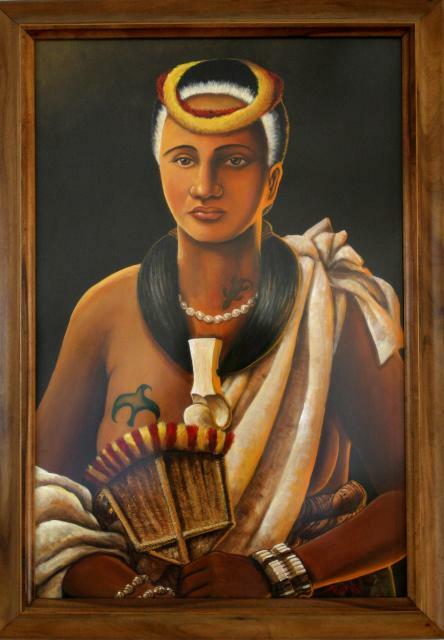 In 1823, Queen Kaʻahumanu and six high chiefs requested to be baptized as Christians. 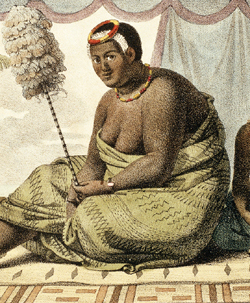 The Queen Kaʻahumanu's government then banned prostitution and drunkenness, resulting in sailors resenting the missionaries influence. 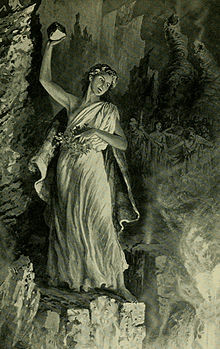 In 1824, Chiefess Kapiolani, the cousin of Kamehameha I, defied the volcano goddess Pele by saying a Christian prayer, climbing down into the lava crater and returning unharmed, then eating the forbidden Ōhelo berries. 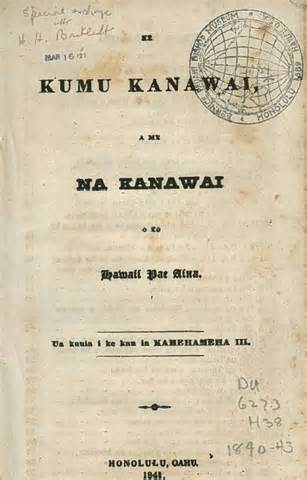 In 1825, Queen Ke'opuolani was baptized into the Christian faith, speaking Hawaii's Motto, "The Life of the Land is Perpetuated in Righteousness" ("Ua Mau Ke Ea O Ka Aina I Ka Pono"). 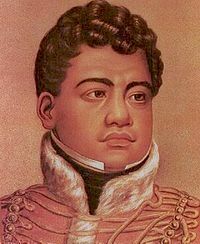 When Liholiho (King Kamehameha II) died, his brother, King Kamehameha III, ascended to the throne, having the longest reign in Hawaii's history, 1825-1854. 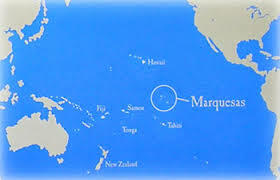 The various island kingdoms of the Pacific had no navies capable of repelling the global maritime powers of the day, namely, Portuguese, Spanish, Dutch, French, British, and Japanese. 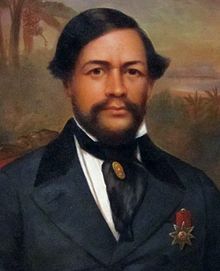 King Kamehameha III was instrumental in using diplomacy to keep the Kingdom of Hawaii from being taken over by the British and French. 'God hath made of one blood all nations of men to dwell on the earth,' in unity and blessedness. Wherefore we first present our supplication to HIM, that he will guide us to right measures and sustain us in our work." I. That no law shall be enacted which is at variance with the word of the Lord Jehovah, or at variance with the general spirit of His word. All laws of the Islands shall be in consistency with the general spirit of God's law. 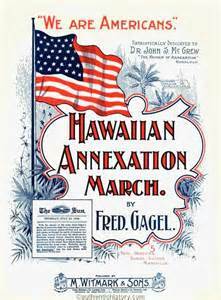 The above constitution has been agreed to by the Nobles, and we have hereunto subscribed our names, this eighth day of October, in the year of our Lord 1840, at Honolulu, Oahu. 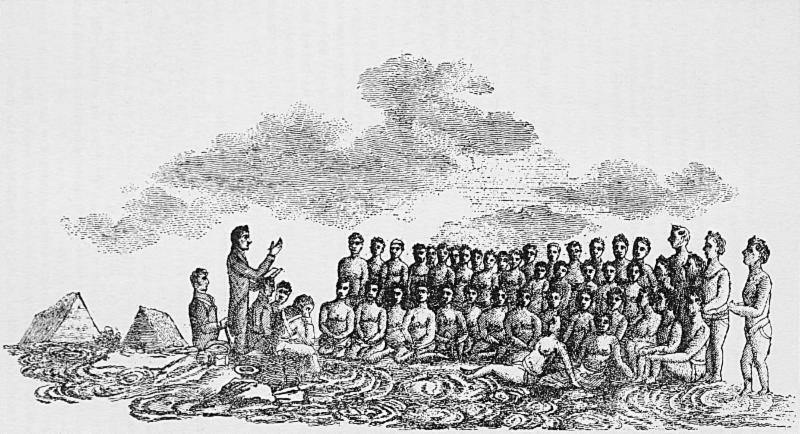 King Kamehameha III granted the 'Ka Wai" freshwater springs where High Chiefess Ha'o frequented to be the location for building of the historic Kawaiaha'o Church. 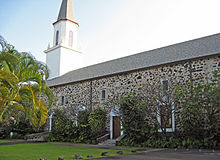 Located on the Island of O'ahu, the Kawaiaha'o Church is listed on the state and national registers of historic sites, as it is one of the first Christian churches in Hawaii. 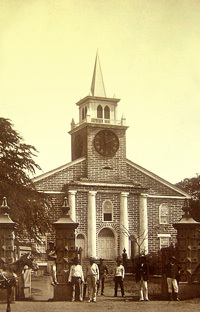 Built between 1836-1842 in New England style architecture, Kawaiaha'o Church was called the "Westminster Abbey of Hawaii." Constructed with 14,000 coral slabs, quarried by hand from reefs 10 to 20 feet under water - each slab weighed more than 1,000 pounds. Within its walls the kingdom's royalty prayed, sang hymns, were married, christened their children, and finally laid in state. On the grounds surrounding the church are buried some of the original missionaries. 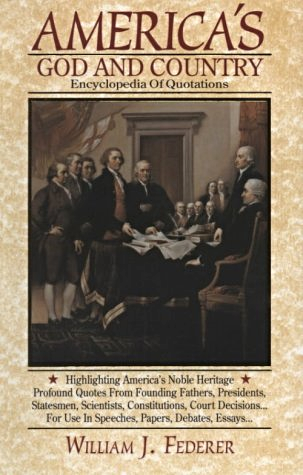 "The French government is celebrating the 14th of July in Papeete (Bastille Day), as America does on the 4th of July. 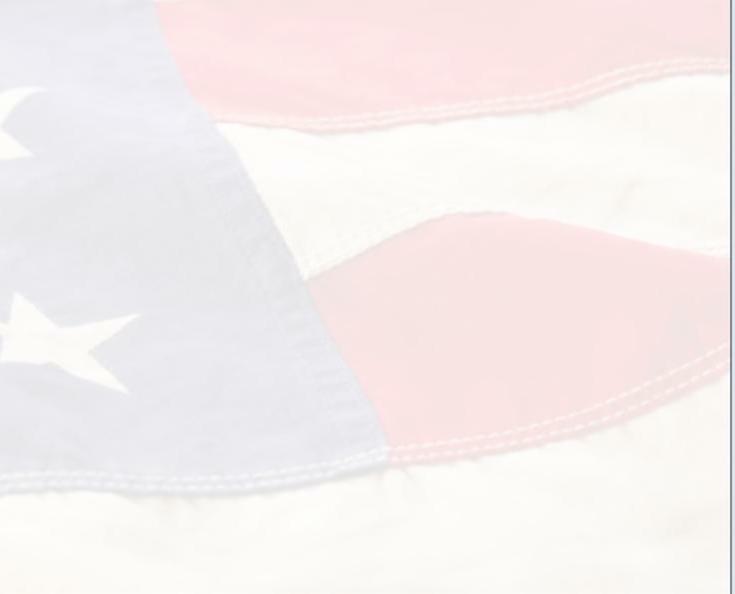 What Americans do to celebrate is to give speeches, worship God, do things to strengthen the body, and so on. 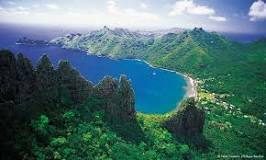 The French are pleasure lovers, acting as in the old days ... the dances of Tahiti, Tuamotu, Rurutu, Tubuai, and Atiu ... What is done is like what the (filthy arioi?) did. It is a very painful thing for our eyes to behold, because all kinds of liquor are allowed on the tables on this day-beer, soda, wine, whiskey." Hawaii became a U.S. Territory JULY 7, 1898, when President McKinley signed the Treaty of Annexation. 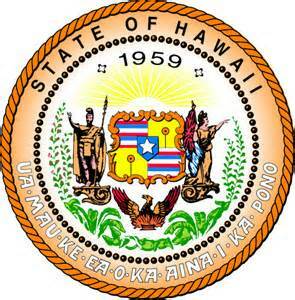 In 1959, Hawaii became the 50th U.S. State. The occasion was marked by ceremonies within the sanctuary walls of the Kawaiaha'o Church. 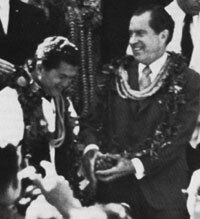 "Reverend Akaka ... I wanted to attend ... this great church, with all of its history that is here...having in mind the fact that today...you will be commemorating the 150th anniversary of Christianity in ... these islands."